Flawlessly applied powder foundation. Shimmery shoulders and collar bones. Expert contours. It's all yours with this medium oval brush. It's specially designed to help you comfortably create the expert styles you desire with ease. So go ahead and give an all-over makeup style a try ... you can do it with Artis Elite. These are the best brushes I have ever had for putting on foundation. I previously had the oval 6 and wanted one slightly larger. They make your skin look really smooth. Well worth the price. I was going to purchase a knock off brand of these brushes and I saw the reviews on YouTube and saw how terrible the worked compared to the real thing. I have been very happy with my purchase. I am a brush lover. 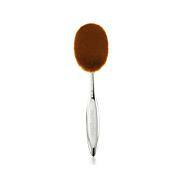 I had an Artis Fluenta Oval 8 brush for quite a while now. I wanted a smaller brush to get into the little corners better. 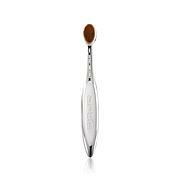 Well, I love my oval 8 brush and so far she is still top ranking. I find myself using this brush daily to get used to it. I didn't find this to be flimsy like the dupes online. I was able to use this and feel it wouldn't break in my hands. It applied my foundation effortlessly, but more time was used than with my oval 8. I have since ordered the Oval 6 and 4 which will complete my Artis purchases. I love the way these brushes effortlessly airbrushes my foundation giving me maximum coverage with just one pump of foundation. When you use expensive foundation, this brush pays for itself very quickly. Please don't buy countless knockoffs to get the experience you get with the genuine product.. It just won't compare. All I can say is I am by far a makeup diehard when it comes to brushes and this BRUSH will be my last brand as far as searching for any other!AMAZING! If you do not have one then invest in one! I promise you that!